This essay is not an analysis of violence but a hymn to that evangelical virtue which is especially attractive to those who have had too long a familiarity with death. Such an experience is fruitful only if it is understood in the light of the Gospel. Otherwise, repeated daily atrocities can bring people to the edge of nothingness, to a despair inspired by the total collapse of society. Faced with the sense of non-being that such experiences induce, only a vision of light can disclose signs of a christic time. In the middle of a storm the only question is how to be saved from it. In such a situation it is normal for people to be tempted by the immediacy of a drab ultra-pragmatism. When it seems to extend indefinitely to total despair, my only question is how to save myself from death. But when death becomes the only fact of everyday life, because it is no longer an exceptional event, it becomes banal. It is just another object, like a stone, and only acquires meaning if it is huge or occurs in large numbers. In the abyss of the annihilation, both of things and of people—starting with those wreaking the destruction—the true sin is insensibility. Confronted with violence, we can join in the deathly dance, and conceive of an heroic rescue because we have the hands of a strangler and can no longer find an expert who will establish the distinction—if it ever existed in God’s eyes—between the combatant and the murderer. Meanwhile we defend values we never practiced, which are ambiguous or disturbing because we defend them on a level other than their own, and have become perverted by hatred or mutilated by being cut off from a cohesive context of values. We will never sufficiently realize that murder springs from the heart, that no evil is external, and that violence is simply the forthright expression of pride and of the vanity of tribes which cannot recognize God’s face in the Other. There can be no genuine discourse about sin because sin is irrational. When the soul is perverted by sin, it is no longer structured by the Logos, the source of its peace and order. Repetition of sin gives birth to passion, which is moral folly in the pure state, the death of the Logos, and then simply death. When the apostle says that death is the penalty for sin, he is not talking about a punishment meted out to the sinner from outside by a divine verdict: God is not an executioner. It is simply that death is inherent in every evil that our mind presents to us; every sin contains the germ of death. It is, first, the destroyer of inner being, and potentially of every being. Doesn’t the adulteration of relationships between people derive from an initial message that has woven false links between them, suffocating the truth? Physical violence is only an eloquent expression of self-hatred, due to fear of the truth that we no longer transmit because we don’t want to live it. To victimize oneself out of hatred of God and then to falsely reestablish oneself in life by inflicting death on others represents the implacable logic of those who have deliberately cut their ties with the source of life. In God’s very name they have confirmed themselves in Promethean folly, offering the challenge of a kind of freedom, denying the Word of God who alone rules over us and in whom our freedom is based. The hieratic society that empties the name of God of all content practices a horrible paganism. “God” becomes just a word used to express the will to power and the religious symbol becomes a sign of terror. In this way God can ultimately be transformed first to a concept, and then into an idol, instrument of a history that one no longer receives from him but forges for oneself and then attributes to him. Holiness gives place to heroism: only the warrior is holy. In this situation each faction makes its own interpretation of divine thought since God alone conducts war. Our faith in God is based on this foundation, for it is he who scatters death among our enemies and in the control over these deaths God becomes authentic. Is not man called his vicar, as the Koran affirms? Naturally, each group assigns this role of vicar to itself. And if we believe we are divinely invested with this function here on earth, it follows that we have power over life and death. All war is metaphysical; one can only go to war religiously. In the state of peace we can easily believe ourselves secularized. Regardless of what words are used, wartime encourages us to be mystical. If we didn’t believe that the transfer from the will of God to the human will, was being carried out legitimately, we would begin to question ourselves as interpreters of human destiny. This doubt would lead to reconciliation and hence to the rationality that consists in situating the Logos as superior and anterior to our personal option, a rationality that includes the Other. What we need from the outset, therefore, is the non-existence of others. They may seem to exist, since we are fighting them, but that is only a minor detail since the mystique of war is more important that the war. The others have no historical reference point; if they had, they would be part of a discourse of unity. In a certain kind of war it is not a question of conquering, since we are victorious from the start because of how we think about God. Victory is a sort of platonic idea, whatever its empirical expression. If the latter is not commensurate with the eternal model, it is the empirical reality that has to change. By identifying ourselves with the whole, we issue an anathema. So much the worse for the facts if we do not numerically constitute the whole. There’s always a sacred alliance that God can support. Otherwise, God wouldn’t have a permanent vicar. The historical event that we repeat is simply a sign of the metahistorical truth with which we are providentially entrusted. It is this mission which founds the present and guaranties the future. Defeats only encourage the myth that we have cultivated, which already proclaims the end of others. When the soul is invaded by the thirst for blood, faith gives way to ideology. The religious vocabulary is maintained but the words change their content. They become symbols of empirical reality or of the meaning we think we find in the concrete situation. The mythological reading of the past becomes the framework of interpretation: that is why others are eliminated from the physical or moral world. If they do not have the right to live today, their existence in the past must have been an error. Although we cannot train them to renounce their identity, and it is too costly to eliminate them from the land of living, we can suppress them from the adobe of the dead by making a travesty of history. They must not be allowed to become part of the historical memory of their people. Their expulsion from time is more important than the present anathema against them. If it is more convenient to tolerate them in space, the first rule is that they accept the status of aliens in history. But a victim who does not revolt is not destroyed completely. The combat is carried out to the end only if the minority does not renounce its reading of history. The necessity of ideology forces the minority to renounce its identity, or at least to adopt a mask that will perhaps veil its personality for a long time. Ideology recognizes a special time during which foundations were laid. Such a period does not simply refer to a period of history but to a rhythm, a sort of Bergsonian durée, which will liberate you, if you are its accomplice—whether out of fear or self-interest—from your specific identity in order to hurl you into what has been chosen for your salvation because it constitutes the truth. What I have described is a subtle, frightening violence, but which, strictly speaking, can dispense with the use of force. Ultimately, the physical weapon is present only as symbol of the anathema. For there is no question but that it is the gods who make war. Earth only reflects the impiety of heaven. Death, the last enemy, is so foreign to our nature that it has to be submitted to divine reason. Repressed by men can women as an eternal thorn in their history, it can be grounded only in God who has the right to choose his lieutenants according to his good pleasure. That is why a doctrine of death does not really have its place in a religion of fatum, in which gods and goddesses endure human passions; a doctrine of the death of others is conceivable only in monotheism, in which God does not know this love-passion that leads him to death. If God does not choose death as his lot, and his resurrection, as well as that of others, which emerges from it, he would inevitably vow those who are not his own to destruction. The God who does not recognize the dialogue interior to himself will give even less recognition to the dialogue with pagans or infidels. To the Hebraic sensibility, the question of Job receive a final answer in the rewards that he obtains after his test. For those who recognize the incommensurable, however, it is only in later monotheism, in which one finds revealed the Lamb which has been sacrificed before all ages, that a response is given to Job. I will pass quickly over the history of Christian peoples in their justification of violence. “Holy wars” were led against “infidels” by various Christian sovereigns, especially in Spain. If the Crusades did not borrow all the elements of Jihad from Islam, it is nonetheless true that the rights of God, of western pilgrims, or of the Byzantine Empire, were defended by mystics. Addressing the English, St. Bernard of Clairvaux declares that “The earth trembles because the Lord of heaven is losing the very land where he appeared among men… And now, because of our sins, the enemy of the Cross has commenced to raise his sacrilegious head and to lay waste the Promised Land.” For St. Bernard the crusade represents a sign of salvation, the pardon of sins, and eternal glory. This master of Christian spirituality is, on every count, in agreement with Islam, which practices conquest in the name of God and sees itself in the role of conqueror. But Islam is not tied to a place but to the Word and justifies holy war out of a desire to propagate God’s word in conquered territory. In countries united to the house of Islam the Moslem religion is imposed on polytheists if they agree to live by it, but hardly ever on Jews and Christians. In addition, Moslem holy war requires the combatant to prepare himself spiritually by struggling against passions. St. Bernard, without knowing it, is a disciple of Islam in that the crusader, like the Moslem, is to achieve salvation through combat on behalf of God. Here the position of the Church of the East is clear. St. John Chrysostom pronounces anathema against anyone who teaches that we are allowed to kill heretics. Moreover, the Church of Cappadocia with St. Basil, as well as the Church of Byzantium, have categorically refused to canonize soldiers killed in battle as martyrs. It is not my intention to discuss the idea of just war in St. Augustine and St. Thomas Aquinas. I don’t believe that Christian reflection on this theme has ever been as perverted as in Byzantium, where each morning every Orthodox Church in the world sings: “God save our people and bless our heritage. Give our pious emperor victory over the barbarians.” It is true that the Byzantines only accepted the idea of defensive war, and that for them the oecumene included all the Christian nations of the empire. In their eyes the failure to halt the barbarian invasion would have meant the oppression of the Church and the rule of the uncivilized. I can also understand their fierce desire to save Constantinople, dear to God and to his Mother, before its fall in the 15th century. How many holy monks, illustrious prelate, and venerable witnesses of the most beautiful liturgy in the world were able to sing in the Acathiste that the Theotokos was the rampart of the Empire? 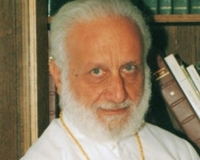 How could the Church, which in a completely Biblical coherence, produced the only equilibrium I know of, between a theology of the cross and a theology of glory, how could it for so many centuries, in the purest places of meditation, confuse the cause of Christ with that of the Empire, and later of all the Orthodox kingdoms? How could it affirm in its liturgy that the Cross is the power of the emperor? This was the atmosphere familiar to the Prophet of Islam, which the Koran will consecrate and surpass. At the time of the Cistercian reform people knew little about Byzantium and understood it badly, but the Western intelligentsia was fascinated by Islam which they read in its sources. Nevertheless, this question cannot be properly clarified as long as violence is not exorcised and its biblical foundations overthrown. If Orthodox Christians really admit that the God of the Old Testament led Israel from victory to victory and submitted all nations to it, they have no reason to question the theology of defensive war of the Byzantines or the Crusades. Keep in mind that it was with the purest intentions that the tribunal of the Inquisition erected its stakes. It was with the ideal of the perfect man that the Nazi warrior carried on his belt the inscription from Isaiah: “Gott mit uns.” What does the Bible say on this subject? The God Sabaoth, in service of Israel and its hegemony over the land of Canaan, only reflects the thirst for conquest of a confederation of Semitic tribes, a spirit that is totally foreign to the unfailingly loving nature of the One who is the God of nations and rules history in all its developments. God, whose name, presence, truth and unicity are love, cannot lend Himself to the massacres perpetrated by Joshua son of Nun. There is a related issue in the way St. Paul deals with the concubinage of Abraham. The perfect chastity which he advocates in his Epistles is not invoked as a judgement on the patriarch. Nevertheless, when the apostle employs allegory to explain Abraham’s two wives as figures of the two alliances, he does not necessarily eliminate the historical meaning of the text. The author of the Epistle to the Hebrews seems scarcely to criticize the prostitution of Rahab, which becomes part of the history of salvation: “It was through faith that the walls of Jericho fell down” (Heb 11:30) and by faith the Hebrews “conquered kingdoms” (Heb 11:32). In opposition to this bloody deity there is the image of the gentle God whose voice is heard in the great prophets, especially Jeremiah and Hosea, and in the Song of Songs. In the betrohal of Yahweh and his people, just as in the Servant songs, we recognize the accents of the Gospel. Confronted with the irreducible opposition between these two faces of the Lord, Marcion, in the middle of the 2nd century, thought that the wars, judgments and punishments described in Scripture could not be attributed to the good God, Father of Jesus Christ, but to an inferior deity, the just God of the Jews. It was obvious that the Church, in order to preserve the unity of the Scripture, had to reject Marcionite dualism. Byzantine iconography is so impregnated with the identity between Yahweh and Christ that it always writes on the nimbus that surrounds Christ’s head o wn, the Septuagint translation of Yahweh in the epiphany of the Burning Bush. The patristic exegesis of the Old Testament is basically typological. Clement of Rome, who tells the story of Rahab and the spies in detail, says that the scarlet coed that the prostitute attaches to the window is a type of the blood shed by Christ. The raising of Moses’ arms above the battle between Israel and Amalek will be interpreted by the Tradition as a type of the Cross, and exegesis reflected in Byzantine hymns and vigil readings. The problem concerns the how of revelation, the real meaning of inspiration. If it is right to affirm that, in a certain manner, the Old Testament is an icon of the New, the latter is also type or prototype of the Old, in the way that Saint Basil calls the bread and wine of the Eucharist before the epiclesis antetypes of the Body and Blood of the Lord. Thus I would rather apply the term type to the realities of the New Testament, with the Gospel already inaugurating the eschaton. Nevertheless, the typological exegesis of the Fathers adopted by the liturgy can veil the historical meaning. That is why I would like to propose, in a complementary sense, what could be called a kenotic reading of the Scriptures. I borrow the term from the Epistle to the Philippians where it is a question of the humiliations of Christ, from the form of God to the form of man, from the form of man to the form of a slave, from the form of a slave to death on the cross. In the kenosis the divinity of nature does not disappear but it is not made manifest. In this mystery divine knowledge becomes operational only through human growth. The synergy of the two natures also runs through Scripture, which is the body of Christ. Because of divine condescension the Word is sometimes profoundly hidden beneath words, underneath the fleshly covering of Scripture. This is what the West calls the personality or subjectivity of the sacred author. In fact, all divine writing shapes itself in human terms and everything human bears in itself the divine model. In the light of this explanation I refuse to attribute the wars waged by Israel to the divine will. Otherwise we get trapped in the morality of means, making death an instrument of life, and the destruction of various tribes becomes a condition of faith, and part of God’s plan for the exaltation and prosperity of a particular people. Yahweh cannot be pardoned for his mighty deeds of war by peoples who were crushed because of the weight of history and the unreadiness of Israel through the ages. In any case, the notion of progressive revelation can be understood only in terms of spiritual maturity, a purification even within divine beauty. For there is no possible path from the warrior-God of Exodus and Joshua to the God of Jesus Christ. That monstrous image cannot be made acceptable. The progress of revelation seems to me to depend on Hegelian dialectic and there is no trace of this awareness of evolution in Hebraic thought. I do not believe that the Bible is truly a history of salvation: God reveals himself in time, but history is not the matrix of divine thought. It is the locus of revelations, and later, the incarnation of the Word. Hence it is the area of faith’s intelligibility, but it can in no way be its formative principle. If history is all human, it receives the divine without any confusion. That is why Scripture is not the unfolding of the divine in time but the identity of divine epiphanies across time; the only difference between the epiphanies is that they are not clothed with the same splendor, because of the divine pedagogy, or the economy that God uses, out of love, veiling himself to different degrees. But if everything was consummated on the cross, the ultimate truth about God is a truth of love. If Christ is the revealer and locus of divine discourse, He presents himself, in His life and death, as the only exegete of Scripture and its sole reference point. On this basis God was not the author of the sufferings of Canaan and of conquered peoples. When Joshua commanded armies, He who will later bear the same name was already, in his precedence to Abraham, on the side of the victim, just as he was on Isaac’s side when God of Abraham commanded him to offer his son as sacrifice. Yahweh was not revealed by his raised arms and his powerful hand but in every weakness of those whom the armies of God Sabaoth were overwhelming. That God was a simplistic reading that Israel made of its own power. Israel was the people of God but not the body of Yahweh. This reality of God’s body was not able to be revealed prior to the intra-Trinitarian kenosis and the nothingness of love brought about by Jesus. It was necessary for the Lord, by his suffering, to attain the perfection of his humanity so that the very perfection of God would be known. It is only by beginning with this feebleness of God that we can understand Jesus’ teaching and the unanimous tradition before Augustine about not resisting evil. The great tempter, face to face with the apparent powerlessness of Jesus on the cross, demands that he come down from it. The supreme temptation is to believe that we can change the world without God, or that one can, one ought, to impose human instruments on God. At the moment when the Lord of the universe seems to have abandoned the world and to have therefore proclaimed his own death, humanity lays hold of this emptiness in order to make justice reign. The revolution and the counter-revolution, which are of Promethean scope, have as their point of departure the absence of God as Savior. Berdyaev was right to maintain that every revolution is degraded because it starts out with the illusion that one can establish justice by getting rid of people, and putting itself in their place, establish other principles of government. A new combination of forces, representing other social backgrounds, will have to intervene, bringing a new social dynamic, so that a creative breath can animate the poor, who have previously been left out of consideration. Violence is presented as the only adequate response to the invisible violence exercised on “the victims of oppression.” There are, of course, dehumanizing situations, structures that represent “established” violence. A large percentage of humanity is reduced to such despair that violence seems to be their only recourse. Those who cannot exercise their right to participate in power or exercise a public function because of their color, religion, or ideological neutrality, those who are deprived of their right to vote, and cannot get an education, adequate food and medical care, are undergoing an injustice which is the worst violences. Civil war or war on behalf of others, which produces further complications and reproduces itself indefinitely in a vicious cycle that ends only with general famine, shows the absurdity of violence. At that level of intensity and extension to protest against violence is meaningless. The institutionalization of war makes it impossible to bring up St. Thomas’ question about revolt against the tyrant. There is obviously what Dom Helder Camara calls a “spiral of violence,” whose dialectic is injustice/revolt/repression. One is beyond the simple right or duty to change the government when all governments are reduced to powerlessness in an uncontrollable situation that has reached the ultimate in irrationality. Under these conditions violence is no longer even a means. When hatred, fear, suspicion, corruption, fanaticism and oppression have reached their climax, the question of the option between one and another political solution becomes superfluous. Every political attitude is a calculation and hence something less than complete testimony, for at this level of the disintegration of society, as defined by parallel existences, every policy is political. A genuine politics is conceivable only when it grows out of an interior debate. Since such discourse includes the other, one already places oneself beyond the question of means. I have to liberate myself from the narrow notion of the group and my identity in the group in order to welcome another face, in the light of which I can perceive my own, and enter the world of the person. In the perspective of a purpose that foreshadows a communion of love, society is not just an empirical reality concerned with law and economic development. From the point of view of effectiveness, it is a matter of trying humbly to put order into a society according to appropriate and provisory formulas. Perhaps we can’t aim at anything else, especially in the Third World where everything is so fragile. Politics can’t be redeemed in its inner being. If humanity has a purpose, a society of men and women is not a number but a communion of people, which ultimately conceivable only if they are all deified together by the Eucharist. Both citizenship and the state are consummated only in the eschatological community that will put an end to tribal status, nations, and separate languages. I am only presenting a testimony; I make no claims as to the political merits of such an evangelical commitment. It would be political suicide if politics is considered an autonomous domain. In a spiritual vision, however, the frontiers between human communities tend to disappear, and it would be absurd to have one behavior completely governed by realpolitik and another dictated by a search for the Kingdom. If the Kingdom of God is seen in filigree in the empire of Caesar, that is because there is no such thing as civil society in the pure state. The latter is ordained to the society of communion that englobes it or gives life to it. As Origen said, “The Church is the cosmos of the cosmos”—it is itself the spiritual universe which contains the historical universe. The unanimous tradition of the primitive Church against war clearly shows that it was doctrinal position. One might have that loyalty to the Empire and Paul’s adhesion to the pax romana would have meant acceptance of the military order. But apart from the centurion Cornelius and the jailer baptized by Paul at Philippi, we don’t find any mention of a Christian soldier before 170. The non-participation of Christians in the defense of Jerusalem in the year 70 and their flight to Pella shows that they were hardly interested of Jerusalem. The pagan Celsus, about 178, exhorts Christians to aid the Emperor with all their strength in order to support justice, to fight for him and serve as soldiers because if the Emperor were left alone and abandoned, the res publica would fall into the hands of the lawless and the barbarians1. We know from the writings of Tertullian that there were a large number of soldiers in the Roman armies, and nevertheless, in his Catholic period, Tertullian writes that the Lord, by disarming Peter, has challenged every soldier. No uniform is legitimate among Christians, he asserts, if it is linked to an illegitimate duty2. Those who desire baptism in the Lord must abstain from military service and every public function. Origen, drawing on Tertullian’s interpretation of Jesus’ arrest, when he forbids Peter to kill the soldier, says that Christians cannot defend themselves against their enemies, that they cannot destroy anyone, that they are no longer to take up the sword against a nation, no longer to learn war. He responds to Celsus’s argument by saying that if the barbarians are evangelized they will submit to the law and become gentle, and only Christians will rule, since, in that case, the Word would have taken possession of all souls. Among the apologists we find the same attitude. Athenagoras, after speaking of massacres, the devastation of cities, the burning of homes along with their inhabitants, and the destruction of entire populations, affirms that no suffering in this life can make reparations for such sins. As for Christians, he says that they cannot allow anyone to be put to death, even for a just cause. For Clement of Alexandria those who practice war no longer fear God. My point in citing these texts is to show that the earliest Christians not only had a horror of war and refused to justify it, but believed they could overcome it by faith, prayer, and the power of God. Whether or not this attitude is utopian, it ought to be preserved since it establishes a testimony that introduces the fire of the of the Spirit in a death situation that can grow to such proportions that every option becomes meaningless, and the only thinkable “solution” consists in killing the largest possible number of one’s opponents. Although this means a political triumph, it will soon bring about the resumption of hostilities. When no one has the means to carry out such a policy, ideology is not only overcome but shown to be false, foreign to its initial, natural purpose, which is the maintenance of existence. When the will to death becomes a pleasure and the princes of the city are armed children, one can’t even bring the theory of non-violence because it will be judged on the basis of effectiveness and preached as apolitical theory. But the sweetness of the Gospel imposes itself apart from any concern for effectiveness, out of a search for salvation, as a sign of the Kingdom that is to come. When a country crumbles completely and people feel like animals, tracked night and day, and are constantly astonished they remain alive, the Lord becomes their only resting-place. If possession of the indestructible Kingdom is given to the humble and gentle, who would be so without love and desire for divine goods as not to make a supreme movement toward humility and gentleness in order to become, as far as it is possible for human beings, the imprint of the Kingdom of God by bearing within them by grace the exact configuration in Spirit to Christ, the great King? …. The soul, in which the majesty of the divine image has been naturally infused, is transformed by free will to the likeness of god… it becomes the all-splendid habitation of the Holy Spirit… Christ always dies voluntarily and mysteriously, becoming incarnate in those who are saved, creating the soul to which a virgin mother gives birth. Because of its close, everyday contact with those who weep, the Gospel represents, above all, compassion of heart, a gentler glance, the baptism of tears. The patience of the saints allows us to understand that a considerable number of men and women no longer have any grounds for imagining a future, either immediate or long-term, but God reveals himself to them in his splendor in the midst of their humiliation. This Kingdom, which is within us, becomes the portion of those who no longer judge. For those who have lived through the experience of a nameless abyss, there is nothing but sacrificial death and martyrdom. The new creation is within you. You know this, quite apart from every reference to history, or any human realization. This gentle murmur was the locus of divine revelation, the ultimate revelation. It is not by chance that of all the virtues with which the sacred humanity of the Lord was clothed, he retained only one to propose to his disciples: “Shoulder my yoke and learn from me, for I am gentle and humble of heart” (Mt 11:29). This virtue, among others, will be the fruit of the Spirit (Gal 5:22-23). A Christian people, whose heart has been converted to the Holy Face and which lives the kenosis of the face of God, may in fidelity to the absolute never produce anything spectacular, but simply transmit the words that have been said to it, the forms that contain its prayer. Carrying the cross of Jesus in obedience to the commandment of love, it will bear witness, in the darkness of history, to the eternal Passover. 1. Origen, Against Celsus, VIII, 68.